The annual boys weekend in Europe took a turn with the invite list this year being extended to newcomers including…shock/horror a girl! Phillipa, one of our climbing buddies, had dared to invade the sanctity of the previously all-male crew. 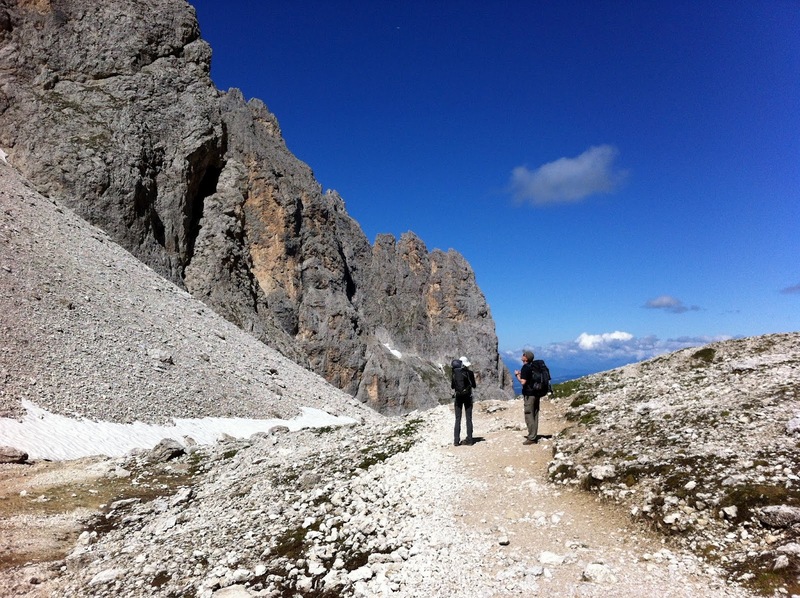 After Switzerland and the Tour de Wildhorn last year it was the turn of the Dolomiti to welcome a group of pilgrams in search of mountains, sun and a spot of via-ferrata. The Sella Gruppo was the destination with a few routes scoped but there was still the uncertainty of the weather, fitness, hut availability and of course England’s progress in Euro 2012. 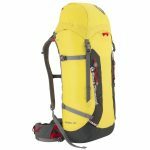 The trip was also a good excuse to look for some new gear and after picking up a good deal on a Mammut VF lanyard and I also took the opportunity for a last minute dash to Urban Rock the night before we flew and grab a Black Diamond Speed 30 to add to my burgeoning rucksack collection. Flying to Zurich on the Thursday we were picked up by Rob who lives in France and Gerry who was working across there. 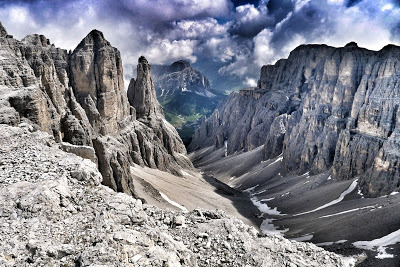 After a long journey through Austria towards Innsbruck we headed south through the Alps into Italy and as we turned off the E45/A22 motorway we were soon catching the odd glimpse of the inimitable rocky spires that signify the Dolomites. Passing through Selva we headed up to Sellajoch, the high-pass between the main Sella group which includes the peak of Piz Boe, and the smaller satellite range to the west. 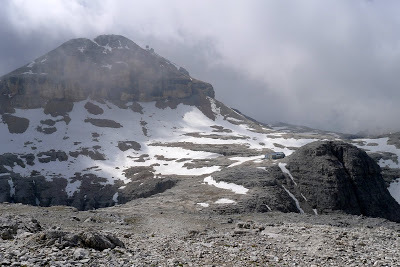 We’d booked the first two evenings in Refugio Salei – a rather modern hut in traditional style which sat just off the high pass giving wonderful panoramic views and as we sat down to dinner we were treated to an impressive lightning show in the distance. After breakfast and we made our way down to the Sasso Lungo gondola where we would ‘cheat’ and be transported up to Rif. T. Demetz at 2685m. 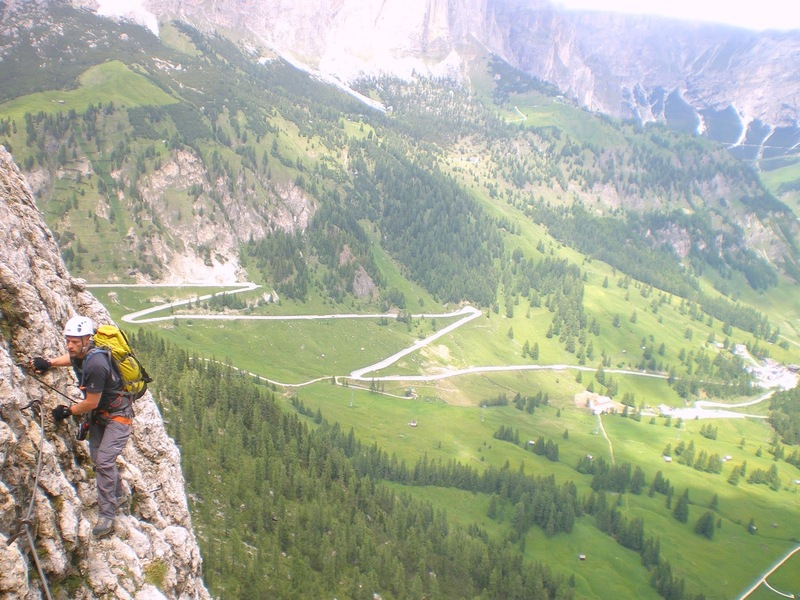 Our destination on this circular route was the Oscar Schuster Via Ferrata – a 300m easy VF, giving an easy intro into into the art of via ferrata. From the top of the gondala we crossed remnants of snow and began a 400m descent, surrounded by steep walls, down to Rifugio Vicenza. From here we were turning left and heading up another valley to reach the start of the VF. It was a long trudge up-hill, carefully crossing a few remaining snowfields before reaching the start of the wire. The excitement built as the team donned their harnesses, helmets and shiny new VF lanyards. The early route was broken up with scrambling before becoming more sustained and surprisingly hard work. The VF process of clipping is straightforward and logical but the unclip-clip-unclip-clip is repeated seemingly every few seconds. A few sore knuckles later you soon get the knack of it, as well as making sure the carabiner doesn’t hook itself over the bolt which halts your upward progress when you least expect it. Half-way up we crossed a short snowy ridge and plonked down for a drink and snack in the welcome shade. The situation was stunning with towering spires and runnel-filled rock faces every which way. Ascending some ladders we were quickly back onto the VF which steepened a bit but then seemed to end all to abruptly before a loose scramble up to the summit of Sasso Piatto at 2953m. The magnificent views were short-lived as a 40-strong group of german schoolchildren came trudging up the path which was to be our descent route. 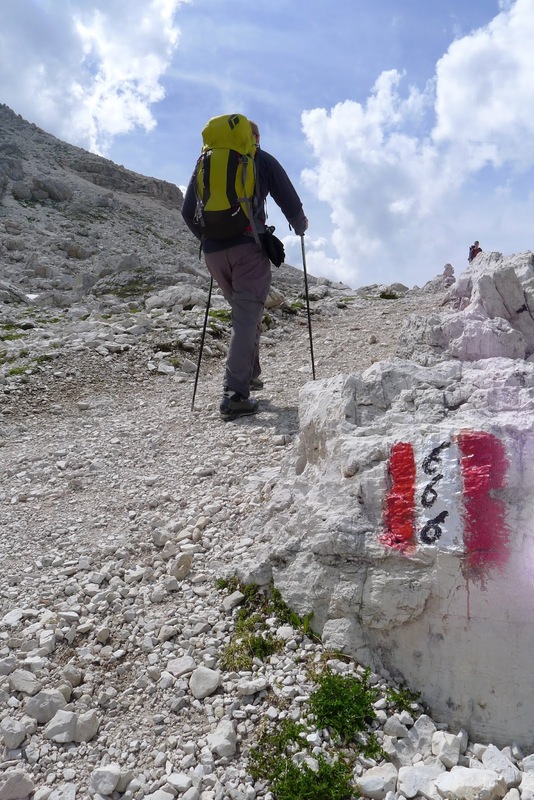 We took a long descent south-west down to Rif Sasso Piatto and then it was a case of skirting the massif east, past another couple of refugios and descending back to our base. The guide-book had said 6 hours – we had taken 9 hours including multiple stops, snacks, photo-opportunities…..we were either soaking up the atmosphere, un-fit or just plain slow! Leave at 8am’ was the plan, so I dutifully set the alarm for 7am and was woken abruptly by a bang on the door at 7.45. Bugger – I had set my alarm, I knew I had but then realised my alarm was set for Mon-Fri and it was now Saturday. I had 15 mins to get dressed, grab some breakfast, pack for the day and to pack everything else as we were checking out of the refuge that morning. I threw on some clothes and headed sheepishly up to breakfast quietly alternating between practicing my apology and cursing under my breath. I pitched in my apology immediately before realising that everyone was seemingly nonchalant. Glancing out of the window the reason was readily apparent – it was chucking it down! Now a little bit of rain never stopped a group of hardened mountaineers but the prospect of lightening zapping a VF cable is a shocking one. Relieved, I had time for a quick breakfast, shower and hasty pack before we checked out and drove back to Selva to check out weather forecasts, snow reports and which huts were open/closed and form a new plan. 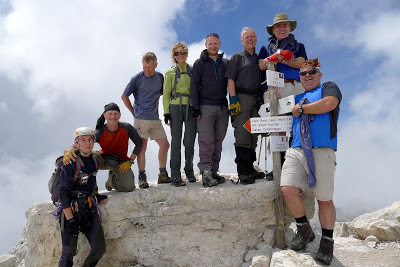 The original plan had to be to make our way up onto the Sella Gruppa range for a few days and tie in a summit of Piz Boe. 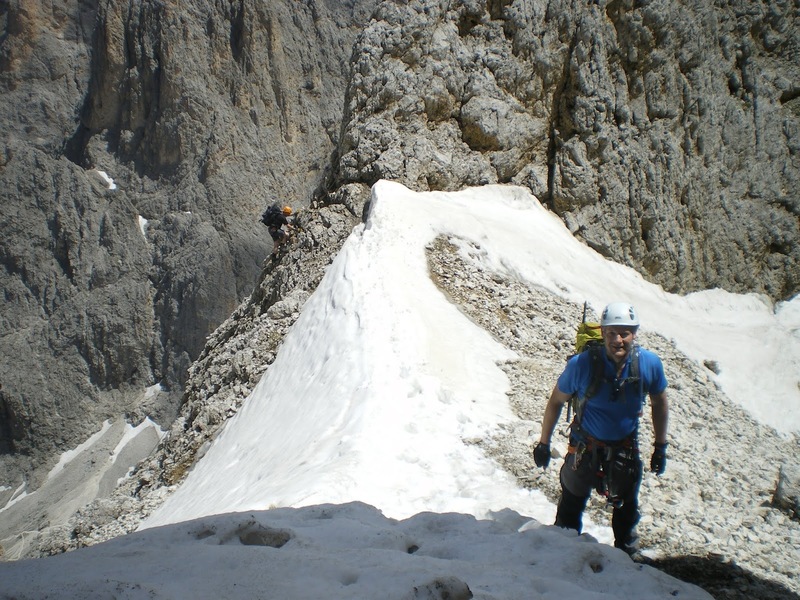 There was no obvious 2-day circular route but we planned to ascend by the VF Delle Mesules – a long challenging VF but which provided the best entry point for a 2-day route. Consulting the maps and the weather forecast our two cars came up with new conflicting plans which were either resolved, negotiated or capitulated depending on your perspective (let’s just say it was interesting with seeing a different side to someone!). 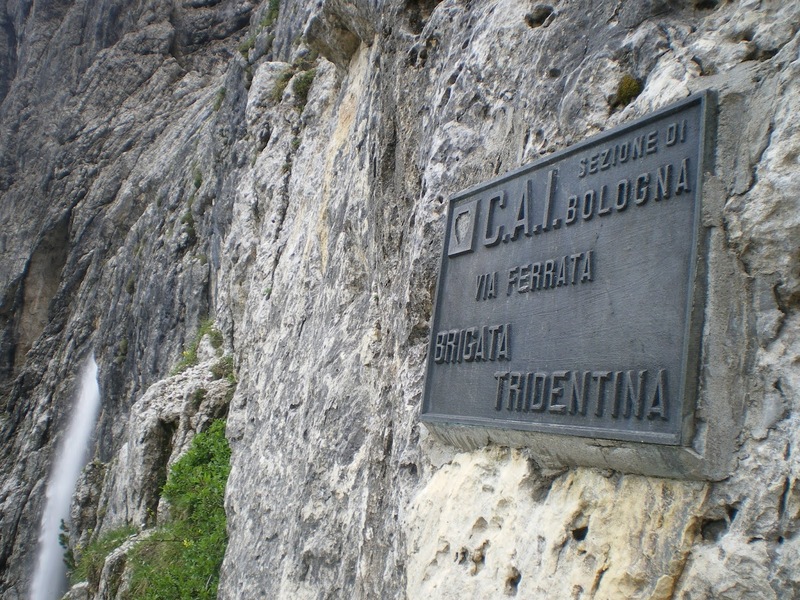 All set, we were to head up to Pass de Gardena which gave us a couple of options – VF Brigata Tridentina or a steep non-VF depending on the likelihood of a storm and a quick exit back down if the Refugio Pisciadu was closed, since we couldn’t contact them to check. Parking at Pass de Gardena we headed up route 666 which skirted up and along the base of huge cliffs with no obvious breach. Rounding a corner the 666 route opened up – basically a scree slog straight up a huge gully with a few cables near the top. With the weather looking promising we decided to head a further kilometre around to reach the start of the Brig. Tridenta, a sustained 750m grade 3B Via Ferrata. After donning our gear the climbing was immediately steeper than the day before. 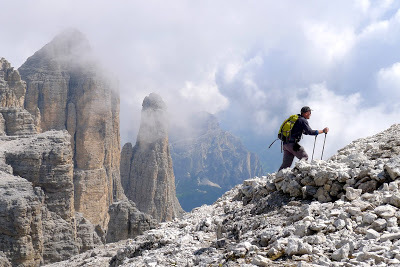 As we gained height the route became steeper and more exposed, but the assurance of the the cable and accommodating rock, which seemed to always reveal a handhold or a foothold at the right time, meant the climbing was fairly straightforward though sustained. Looking back gave some great shots of the exposure with the valley below. 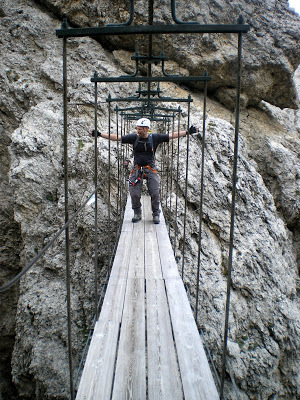 Just over half-way there was a much-needed break and an optional escape route, whereafter the rock steepened again with a few laddered sections culminating in a spectacular wooden/cable bridge across a narrow gorge where we posed for the obligatory photos. 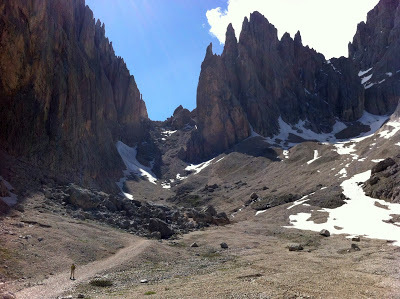 Thereafter the VF finished all to quickly and it was a short slog up to the Refugio Pisciadu at 2587m. We had timed it just right as the refuge had just opened – it’s first day of the season – so accommodation was duly booked for the evening and we lazed in the afternoon sun before dinner and a few welcome beers. 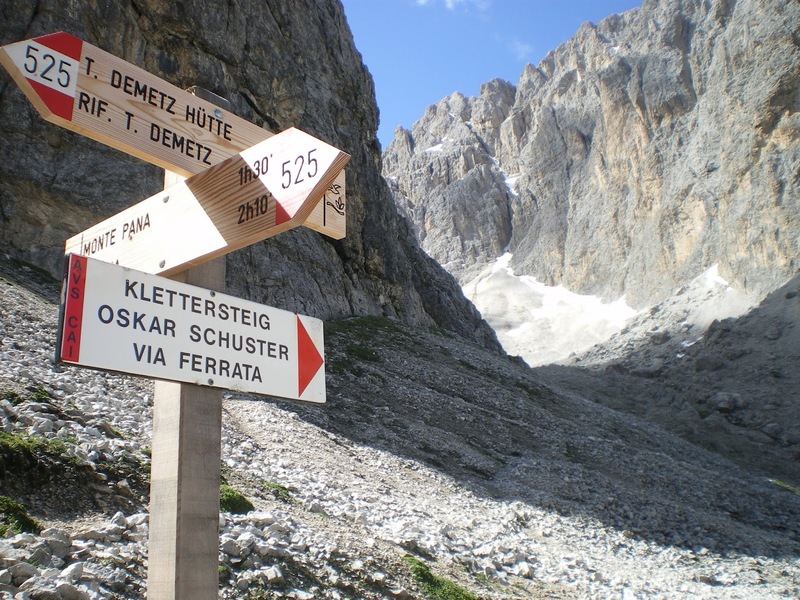 The next day we decided to head up towards Piz Boe, the high point of the range. There was a refuge at the base of the final climb so weather/snow/legs dependent we could duck-out if necessary. The big question was whether to head down the mountain that Sunday night or stay on the mountain and escape early in the morning. With a long drive back to Zurich the next day both driver preference was to get off the mountain that evening. 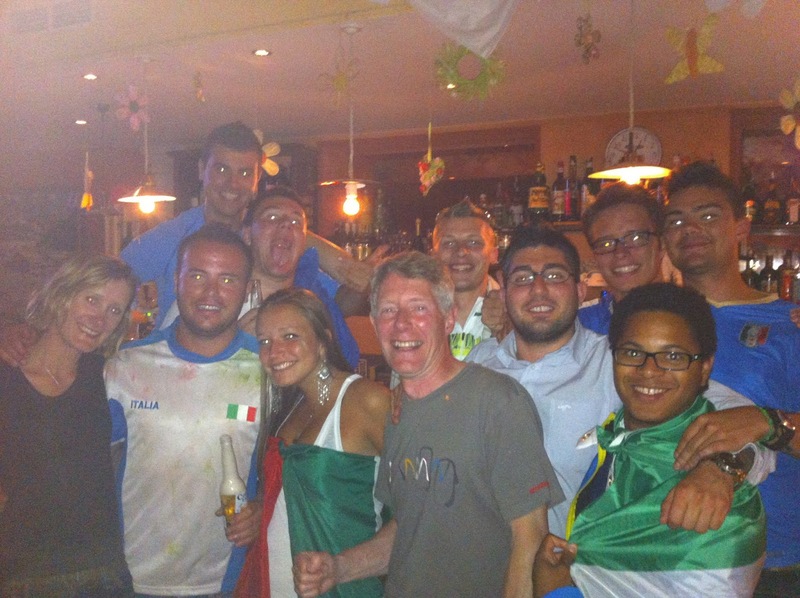 The clincher was England were playing Italy in the Euro 2012 quarter-final so we could watch the match in an Italian bar, so we ditched the heavy stuff from our packs, leaving them in the hut to collect later that day. Leaving the refuge we passed the small lake replete with a beautiful reflection and headed up the valley, veering off to the left. 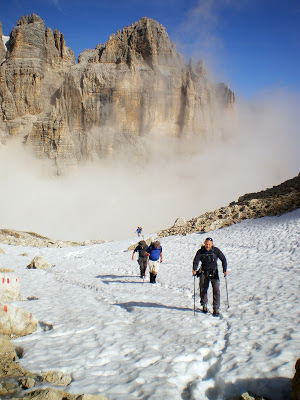 The snow became more regular as we ascended, the route interspersed with bolted cables which we used for handholds rather than don our harnesses. After an hour or so we reached the main plateau from where we could make out the summit of Piz Boe and the refuge at its foot in the distance (just visible in the photo below). 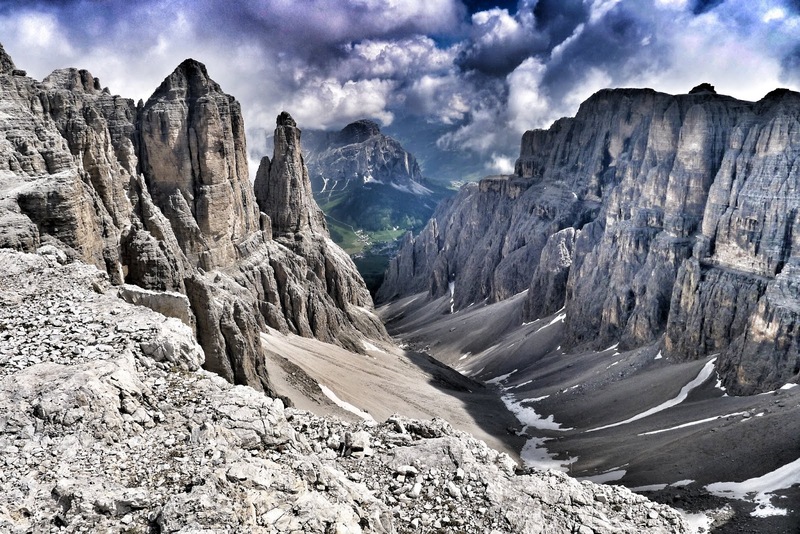 The scenery was stunning with impressive valleys with vertical wall and rocky spires. 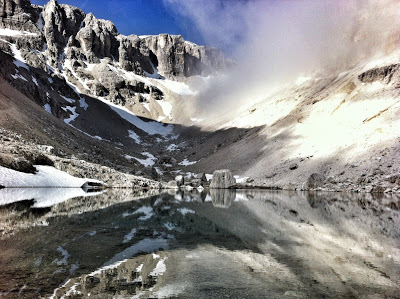 A couple of kilometers finally brought us to Refugio Boe at 2873m from where the final route up to the summit was apparent. A quick coffee and a cake later and we were heading up the final 250m climb to the summit of Piz Boe (3152m) for the obligatory group photo. Unfortunately the swirling cloud obscured the panoramic views, though we occasionally managed a glimpse of our refuge from the first night in the valley far below. Descending the same route the snowfield was best negotiated by glissading on your bum, though not everyone agreed. We decided on an alternate route for the yomp back down to Refugio Pisciadu, heading to a col further round where we had to negotiate a nasty downclimb and then a long (wet) glissade down the snow for a few 100 metres before descending down to the Refuge. After collecting our gear we still had a long descent back to the car and rather than descend the same VF we followed the main route 666 down to the pass which included a few broken sections of cable and a long scree scramble down. After celebratory beer at a hotel in the Pass de Gardena and we jumped in the cars for a short hop into Selva in search of accommodation, food and football. The accommodation and food were fine though the football not so, though we were consoled by a friendly bunch of locals before the long trek home in the morning. If you’d like to see more photo’s of the trip click here. ← Previous Previous post: It’s been a while! Next → Next post: London 2012 – Such a Great Summer! Hi Andy, it was a great trip – it was my first trip to the Dolomites and they were as stunning you imagine. Most of the photo's don't do it justice! I'm sure your kids would enjoy it too. PS. I've added your blog to the list on my blog – hope you don't mind! Awesome photos!!!!!!!! If what you shown are anything to go by, the trip looks like it was one great success. Hope you’ll find your way to more mountains and get more amazing shots. I love them all. Will you be going off somewhere this winter then?